To the memory of Captain G.R. 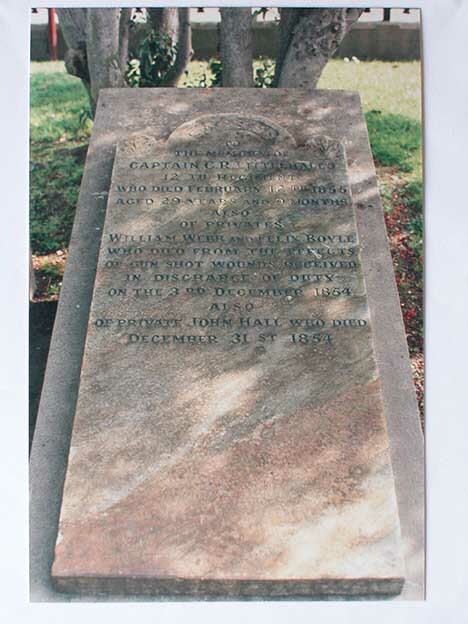 Littlehales 12th Regiment who died February 12th 1855 aged 29 years and 9 months also of Privates William Webb and Felix Boyle who died from the effects of gun shot wounds received in discharge of duty on the 3rd December 1854 also of Private John Hall who died December 31st 1854. Born in 1825 to parents Charles Littlehales (baptised 10 February 1784 St Thomas' Winchester - died 1868) and Anne Carter (1796-1879) George Richards Littlehales was baptised at St Maurice's Church, Winchester, Hampshire on 23 July 1825. In 1851 according to the English Census he was a Lieutenant in the 12th Regiment and residing at 17 Kingsgate Street, Winchester. His father Charles was a medical doctor MD Oxon 1820, Ext, LRCP Lond 1811 according to the London Provincial and Medical Directory. The two inscriptions on stones at Winchester relate John Littlehales MD and his wife Maria Ann Littlehales, grandparents of G. R. Littlehales. John baptised 12 February 1753 at St Leonard's, Brignorth, Shropshire, England. Here lies the remains of John Littlehales MD who departed this life January 2 1810 aged 57 years. The handsome monument erected near this spot by the kind liberality of his friends, bears testimony to his talents and benevolent disposition. His conduct in domestic life secured the love of his family and relatives, and the respect of his friends. Also the remains of his wife Maria Anne Littlehales who died at 31 ? 1786 at the age of 27 years. They lost two of their children, John who died Oct 13 1786, Maria Anne who died June 7, 1783. Their bodies are buried in peace, may their souls live in happiness for ever more. John Littlehales MD, Fellow of the Royal College of Physicians, London and formerly of Pembroke College, Oxford. His eminent professional talents by the blessing of Divine Providence were successfully exerted with a generosity so distinguished and with beneficence to the poor so dissuasive and unwearied amidst a very extended Practice, that his decease was an Event most deeply regretted and lamented. The principal inhabitants of Winchester and its Neighbourhood have erected this monument as a record of their affectionate gratitude to the memory of their friend and e]benefactor but from the Saviour of the World whose faith he adorned by a life devoted to the Christian Benevolence he will receive his final reward. He departed this life the 2nd January 1810 aged 57 years. Captain Littlehales, of the 12th Regiment died on 12 February 1855, according to the Muster Lists of that Regiment for the first quarter of 1855. Unfortunately, there is little detail apart from the recording of his death and the information that he had no will. This death cannot be found in the Victorian Death Registrations. According to correspondence from the Trustees of the Ballarat General Cemetery to the Chief Secretary on 11 June 1856 No. 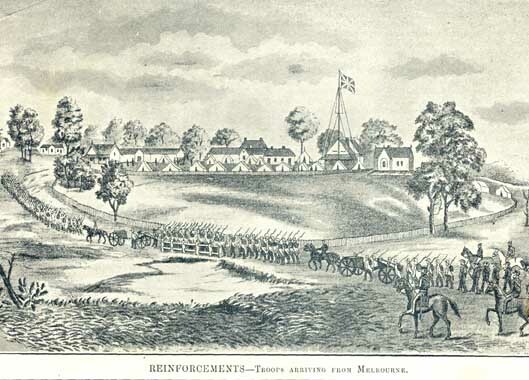 56/947 (corroborated by advertisements in the local journal) a wooden monument was erected first and then a stone put up when the soldiers memorial was erected later in the 1880s. His memory is commemorated on a significant grave in the Ballaarat Old Cemetery, in the enclosure with those of soldiers Webb and Boyle who lost their lives during the Eureka Riots. A large font was donated to Christ Church Cathedral, Ballarat " by his loving parents " ..... " in memory of G.R. Littlehales ". This still stands in the Cathedral today. In Winchester Cathedral, England, two Littlehales' family graves lie in the flagstones within the floor, just above the stone of Jane Austen, and one month old S. A. youngest daughter of the late Reverend George Austen. 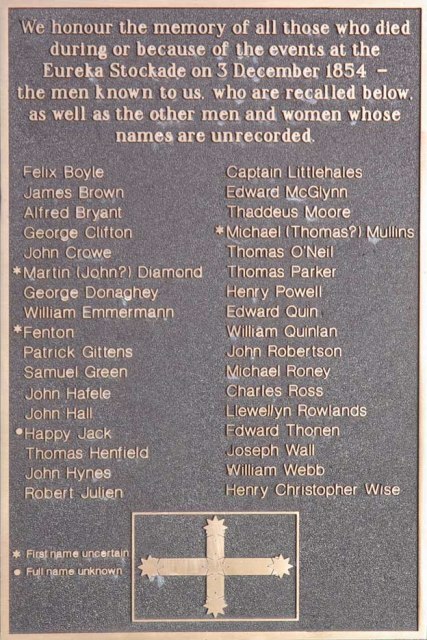 The inscription on Captain Littlehales' stone reads as follows, "Also of Captain George Richard Littlehales of the 12th Regiment of Foot Who died in Camp at Ballarat, Victoria, Australia. The 12th February 1855 and was there buried. Aged 31 years". Although Littlehales "died at the Camp at Ballarat" it is not certain whether or not he was a participant in the battle of Eureka. The extraordinary painting by Abbott depicts the early grave that was erected to Captain Littlehales. From the inscription inside Winchester Cathedral it is known that he died and was buried in Ballarat. The original tombstones in the Ballaarat Old Cemetery were replaced at a later date with those that stand today. George Richards Littlehales will was probated 1 October 1879 Registry Office, Canterbury, England by his brother Eldred Harry Littlehales (banker) for three thousand pounds. This page was last edited on 14 April 2019, at 01:02.